What are the warm-blood equine breeds? The warm blooded breeds were created when warriors returned to Europe from the Middle East and Africa with hot blooded Arabian horses captured in battle. Breeding the large, heavy war horses of northern Europe with the lighter, faster and fiery tempered hot bloods from the Mongolian steppes created horse breeds that combine the quickness and agility of race horses with the larger build and milder temperament of cold bloods. Over time, the draft horses of Europe were increasingly bred with hot blooded imports, creating the forerunners of dozens of breeds in existence today. Warmbloods have smaller heads and bodies than draft horses and tend to be less excitable than hot blooded horses, making them good all-round horses for riding and light work. 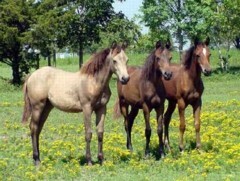 Warm blooded horses are popular in Olympic sporting events such as dressage, and many European breeders are breeding warmbloods for competition. The Hanoverian is one currently breed popular for eventing. Warm-blooded horses are also considered perfect for riding, and in America, the West was won on the backs of warmblood breeds. Considered perfect for roping, cutting and herding, the fortunes of cattle owners increased by the warm bloods and the cowboys who rode them, pushing thousands of head of cattle to the rapidly populating and hungry Western city centers. Most popular American breeds—the Quarter horse, the Tennessee Walking horse and the Palomino—are all examples of excellent horses derived from the original breeding of draft horses and Arabians. If you plan to ride as a sport but aren't looking for a heavy work horse, you will probably buy a warmblood breed. They aren't quick-tempered as hot bloods, but they have a different life's purpose from cold bloods. Excellent for riding, dressage and other events, warm bloods are also the breeds for people who want their children to experience the joys of horseback riding. Read the next horse breeds article on American Paint Horse.